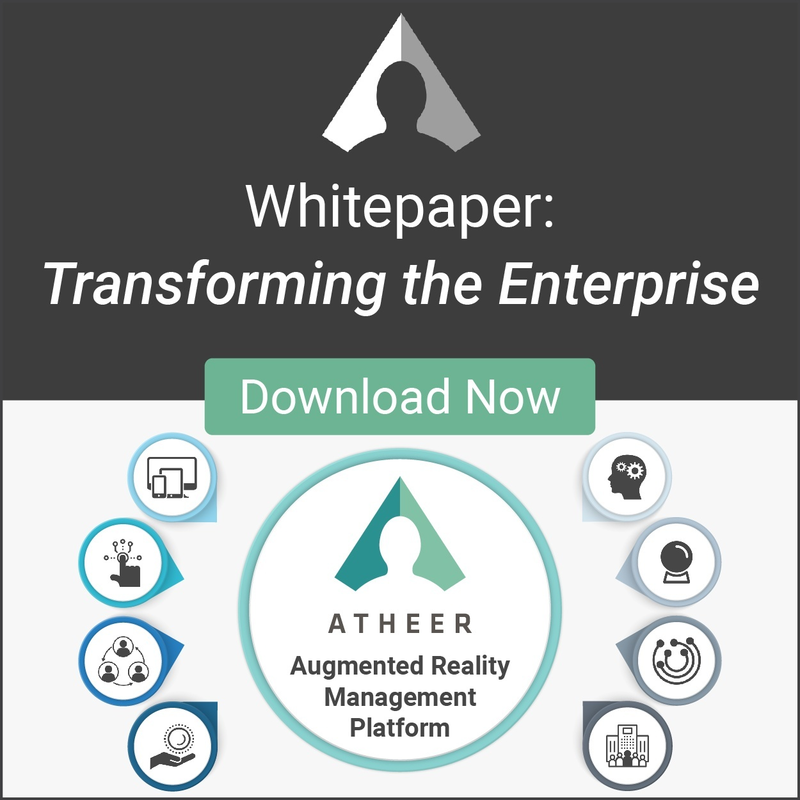 MOUNTAIN VIEW, CA, OCTOBER 30, 2018 - The results of the Atheer 2019 Enterprise AR Readiness Survey are out - and they provide a clear snapshot of an industry in the verge of taking off. The survey, conducted in September and October of 2018, drew insights from 248 respondents around the world. The enterprises we reached out to represented a variety of industries - and companies that ranged from small businesses through to large enterprises with more than 25,000 employees. Regardless of company size, however, the fascinating snapshot of the AR industry that they provided remained pretty consistent. 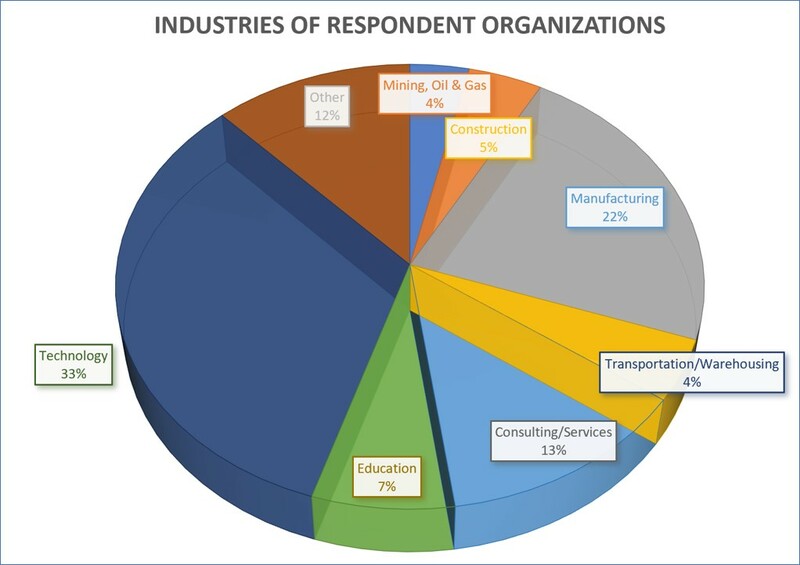 The largest category of respondents in the survey group came from the technology (30 percent) and manufacturing (20 percent) industries. Other noteworthy sectors included transportation and logistics companies and consulting services organizations. The data about where respondents are in their "AR journey" reflects where the entire augmented reality industry is. Among enterprise respondents (with 1,000+ employees), the majority (53 percent) said that they were "testing or implementing with limited and/or local scope" while a further 13 percent were at the stage of having "enterprise-wide AR solutions under deployment/in operation". When asked how they would rate their leadership team's awareness about the full potential of AR, enterprise respondents suggested it was still quite limited. In fact, 25 percent said there was limited awareness about AR overall within leadership, while 45 percent say that a few members of the senior executive teams in their organizations "have taken the lead and the awareness is spreading". Only 20 percent of enterprise respondents said that "a majority of leaders seem clear about the potential" of AR. 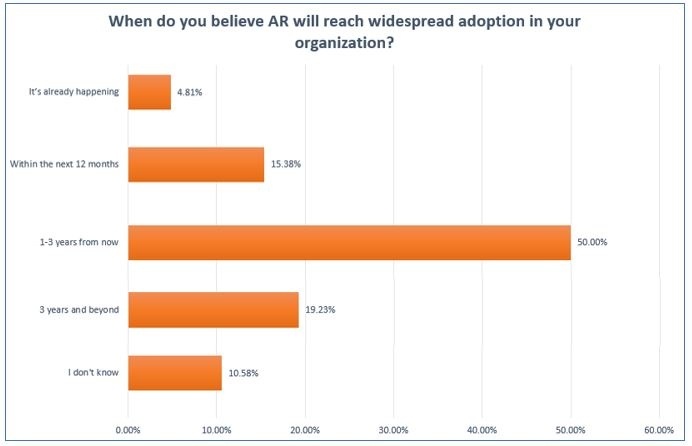 Enterprises were asked "when do you believe AR will reach widespread adoption in your organization" - and 70 percent said that they expect it will happen in their organization within the next three years. Breaking that expectation down, 5 percent said that widespread adoption was already happening, 15 percent said they expect to see that kind of adoption within the next 12 months and a full 50 per cent said they they saw it happening in the "one to three year" time frame. Meanwhile, 20 percent said the time horizon for widespread AR adoption in their organizations was three years from now - or beyond. The survey provides useful data about how enterprises see the potential of AR. When respondents were asked about where in their organizations they saw the biggest potential for AR, they identified training, remote assessment and inspection, manufacturing, assembly and quality - as well as internal maintenance and repair operations. Respondents were allowed to select more than one case case where they saw important potential for AR - with 54 percent citing training, 40 percent identifying the remote assessment and damage inspection use case, 38 per cent saying they saw value in working with AR for manufacturing, assembly and quality control and 36 per cent for internal maintenance and repair operations. 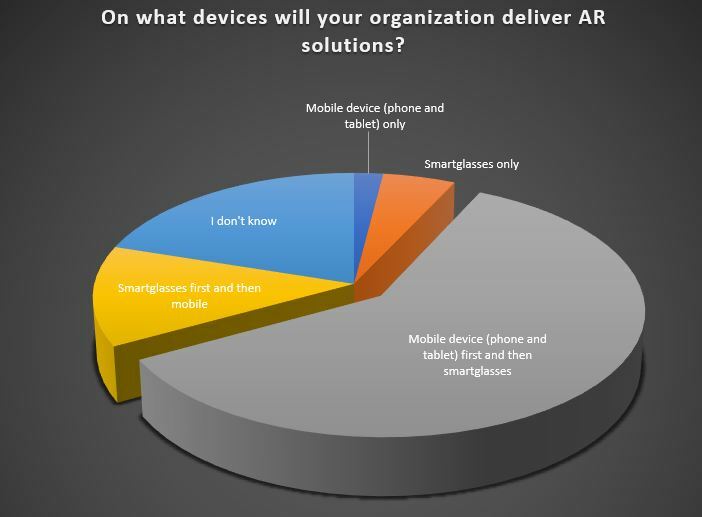 The big takeaway from our results is that - when asked which devices their organization would use to deliver AR solutions - more than half of those surveyed did not just pick a single platform. In fact, 57.69 percent of all respondents said they will deliver AR solutions on mobile devices (ie. tablets and smartphones) first and then offer enterprise AR on smartglasses. A much smaller group of respondents (12.5 percent) said that they would deliver on smartglasses first and then mobile devices. This result very much aligns with the "mobile-first" strategy that Atheer recently outlined as part of its new Augmented Reality Management Platform (or ARMP). The idea is that enterprises need to be able to leverage existing investments in hardware, connectivity, device management and security – all with the knowledge that the value of their cloud-based AR Management Platform will continue to grow and evolve as they take advantage of new AR hardware and operating system enhancements. 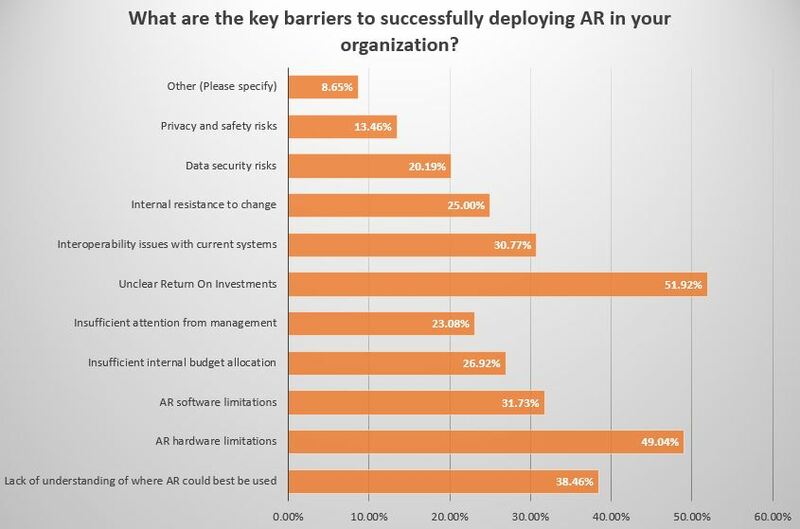 Survey respondents were asked to identify the potential barriers to AR adoption that they might be experiencing in their organization (respondents were allowed to select multiple barriers). The single largest issue (identified by 51.92 percent of enterprise respondents) was a lack of clarity about where the return on investment comes from in an AR deployment. The second biggest concern lay with hardware limitations (49.04 per cent), then lack of understanding AR about where AR could be used best (38.46 percent), AR software limitations (31.73 percent), and interoperability issues with current systems (30.77 percent). The results were welcomed by Petter Andersson, head of professional services at Atheer, Inc. "We thank everyone who participated in this survey, which validates many of the trends we have been seeing in the market - including the need for a mobile-first strategy that provides clear ROI, a broad choice in AR hardware and a better understanding of where and how AR can provide benefit to industrial enterprises," he said. "We will continue to periodically survey the market to gain additional insights from customers to help us serve them more effectively and deliver the enterprise AR platform they need.